What are the facts on tobacco use? Fact #1 is there are many dangers of smoking such as lung cancer. And it doesn't stop there. There are a way lot more of its negative health effects. If you don't smoke but you live with someone who does, you are exposed to secondhand smoke. It is far deadlier. Small children are also more vulnerable to it. Tobacco use doesn't include only cigarettes and cigars. Smokeless tobacco is also included. Every year, hundreds of thousands of people die from different lung diseases. Lung cancer is its worst effect. This is unfortunate but still, prevention is possible. 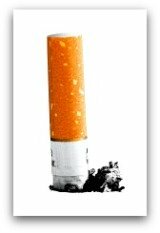 The tobacco in a single cigarette contains more than 400 toxic substances and 4,000 chemical compounds. Out of these mind-boggling dangers of hazardous substances, the most deadly are tar, nicotine and carbon monoxide. A single stick of cigarette contains plenty of poisonous chemicals like benzene. These chemicals silently destroy every single cell in your body and slowly kill you over the years. 1. Tar is carcinogenic. It coats your lungs and causes damage to its healthy cells. 2. Nicotine, which causes the addiction, increases the levels of cholesterol in your body. 3. Carbon monoxide reduces the amount of oxygen inside you. Women who are smokers for a long time and who started the habit young face a higher risk for breast cancer especially the inflammatory type. Men who smoked heavily in their younger years are also more vulnerable to leukemia because of the chemical called benzene. I know of a family friend who smoked a lot and have a really advanced case of emphysema. He is already using a portable oxygen. He can't walk far because he will be short of breath. He is only in his mid-60s and his days are spent sitting on a couch to watch TV. He hasn't tried flying because he spent all his years working and now that he's retired, he's not allowed to travel by air because of his emphysema. Early this year, he has been diagnosed with leukemia. If you smoke and drink a lot, your health is 100% in trouble. Tobacco also enhances the ability of alcohol to cause cancer. And both can weaken your immune system. What can you do? Say no to the dangers of smoking. You and your family will avoid many health problems if you quit.